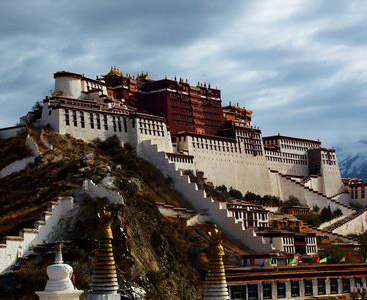 Potala Palace in Tibet, chief residence of Dalai Lamas since the late 1600s, via chinatravelcompass.com. I was looking for the chink in that unfailingly optimistic armor, a moment of emotion from the man who was forced by invading Chinese forces to flee his homeland of Tibet in 1959. I was watching for the beatific smile to slide, perhaps even for tears to well in the eyes behind the glasses perched on the nose of the Dalai Lama. As a journalist, I was also looking for the perfect lede, the emotional hook with which to pull readers into a story about the Dalai Lama’s public speech before roughly 7,000 people in Ottawa, the capital of Canada, on April 28th. Here’s a man who hasn’t been able to go home since he was 16 years old because he is considered a threat by the Chinese Communist regime. I was more interested in the personal than the political and as a skeptic, I was curious – just who IS this guy who can attract, charm and sway the masses the world over? What His Holiness was about to remind me was that sometimes you don’t need to go home, and yes, the personal is political. The diminutive man with the delighted smile is not only a religious leader, he’s a politically adroit, media savvy, influential icon. If I thought I could coax him in any direction for the sake of a quotable quote, a look, a camera-ready moment, I was wrong. In other words, he’s on to you. The press conference was attended by about 20 reporters ranging from local media to Radio Free Asia, Voice of America and ZUMA Press. Reporters were told that after the public talk–which marked the end of a North American speaking tour that included Honolulu, San Diego, California and Chicago–they would be allowed one question, with one follow-up. The tour culminated in Ottawa to coincide with the 6thWorld Parliamentarians’ Convention on Tibet, an international network of politicians that is developing a parliamentary plan of action to advance Tibetan issues and to support His Holiness the Dalai Lama (HHDL) in his efforts for dialogue with China. The Dalai Lama and Canadian Prime Minister Stephen Harper, via canoe.ca. He easily fielded my questions. I asked His Holiness what he said during a meeting with Canadian Prime Minister Stephen Harper. “Ah, top secret, as usual,” he quipped to appreciative laughs from the journalists, photographers and cameramen in attendance. He said he thanked Harper for Canada’s plan to bring up to 1000 Tibetans from eastern India into the country over five years, and he acknowledged the “inconvenience” their meeting could cause the Prime Minister’s plans to expand trade with China. “He had the courage to meet me, so I very much appreciate that,” the Dalai Lama said. “Then,” he said with the kind of smile you usually see from somebody about to play trump, along with a pause for effect, “I mentioned that I am honorary citizen of Canada, so I call him myPrime Minister.” No head-butting or power tripping for this guy. A compliment, a flattery delivered as a simple truth. It was also a disarmingly deft move by the man who calls himself “a simple Buddhist monk,” but who is arguably one of the most influential politicos in the world. As organizers called an end to the press conference, I muttered to the television producer next to me, “I want one more question.” “Well, he’s not gone yet,” she said nodding over to where handlers were assisting him down from the raised platform he’d been sitting on. The Dalai Lama wheeled on me and grabbed my hand. “Where is your home,” he affably challenged, his face inches from mine. Clearly there was going to be no pulling of heart strings, none of this attempt to coax emotion out of him for the benefit of readers – or viewers, for that matter – as the phalanx of TV cameras and still photographers closed around us. Gobsmacked, I couldn’t say a word. I wasn’t even sure I was supposed to. “Where is your home?” he repeated. “You know, there is a very nice Tibetan saying,” he said to me, then turned to his translator. As they talked, he gestured and I felt my hand see-sawing back and forth, firmly clenched in his. “Whoever is kind to you is actually your parent,” the translator finally offered. “Wherever you feel happy, that is your home.” Then the Dalai Lama proceeded to tell a story – one of his “long sentences” – about when he first travelled to Europe in the early 1970s and was asked by a friend, “’Why do you go to these different countries outside India?’ I told him, ‘I consider myself as a citizen of the world, so I have the right to visit more places.’” Ending with a chesty guffaw he released my hand and continued through the group of journalists now leaning forward to press this Buddhist’s flesh. The Dalai Lama had earlier told the Ottawa audience that he got his first good night’s sleep in years after stepping down as Tibet’s political leader in March, 2011. He says he remains the country’s spiritual leader, traveling widely and advocating for “meaningful autonomy” for Tibet, courting high-profile support from movie stars such as Richard Gere, a long-time activist for Tibet who accompanied the Dalai Lama on this trip to Ottawa and also chaired some of the World Parliamentarians’ Convention. The Dalai Lama and actor Richard Gere in Ottawa, Ontario. “He’s widely respected. He can say he’s not a political leader, but of course in a sense he is,” said John Higginbotham, Senior Distinguished Fellow at Carleton University’s School of International Affairs in Ottawa. According to his website, the 14th Dalai Lama, Tenzin Gyatso, was born July 6, 1935 to a farming family in a hamlet in northeastern Tibet. At the age of two, he was recognized as the reincarnation of the 13thDalai Lama. Dalai Lamas are believed to be manifestations of Avalokiteshvara or Chenrezig, the Bodhisattva of Compassion and the patron saint of Tibet. Bodhisattvas are enlightened beings who have postponed their own nirvana and chosen to take rebirth in order to serve humanity. This Dali Lama now lives in exile in the northern Indian town of Dharamsala although he travels widely, speaking and meeting with the leaders of other countries to further the movement to allow Tibet political and religious autonomy. He wields significant political power and influence. The young Dalai Lama, via wikipedia. Higginbotham says the Dalai Lama’s political influence may hold more sway now because China’s social and economic ideologies are undergoing a period of extraordinary change. That was echoed by Carl Gersham, president of the National Endowment for Democracy, a private, congressionally supported grant-making institution seeking to strengthen democratic institutions through non-governmental efforts. The Dalai Lama was awarded the Nobel Peace Prize in 1989 in recognition of his non-violent struggle for Tibet. He was also the first Nobel Laureate to be recognized for his concern for global environmental problems. He is one of those rare leaders that appeals spiritually and politically as well as on very practical and progressive levels too. In retrospect I’m bemused that my idea of a good story about the Dalai Lama was to evoke some romantic concept of hearth and home as that place where we are born and raised and will always be welcome, always accepted, always able to return to. In this story, HHDL is the tragic figure denied a most basic human right. It’s not even something I believe; how true is that for how many of us? To American author Thomas Wolfe’s statement that we can’t go home again, I respond that many of us could go home but might choose not to. As I recently packed a bag for an assignment in Niger, I reflected on how “home” to me is not where my parents are, not the town I was born and went to school in. Home is where my partner and two children are, plain and simple. The Dalai Lama’s skill or niche is that he appeals to the masses by preaching simple truths, with plain words. That isn’t necessarily a simple path or an easy one. But what I find truly sobering is how desperate people in the West are for someone to lead them along it. Becky Rynor is a journalist based in Ottawa, Ontario, Canada.